In a municipal bankruptcy where there is no Emergency Manager running the city it would be up to the Mayor and city Council to decide who to hire to handle the bankruptcy including the attorney and any outside consultants. In the case of Detroit there effectively is a consultant, Emergency Manager, who is making all of the decisions including the hiring of attorneys and consultants. 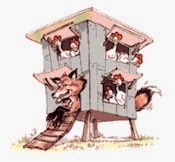 This is analogous to having a fox guard the hen house. For the sake of good internal control and trust of the public, someone other than Kevin Orr should be reviewing, and in some cases overseeing, the attorneys and consultants being hired by the city. I agree with you wholeheartedly. "Power tends to corrupt, and absolute power corrupts absolutely." Governor Snyder has given all of his Emergency Managers absolute power. Governor Snyder is behaving as if he has absolute power and he is encouraging absolute corruption by Kevyn Orr and other EMs. Only PEOPLE UNITED can limit the power that Governor Snyder has.